Obituary for Mrs. Carrie Lee (Windham) Rogers | Collins Funeral Home, Inc.
Carrie Lee Windham Rogers, daughter of the late Deacon Charlie Windham, Sr. and Carrie Durant Windham, was born on January 11, 1928 in Sumter county. She went home to be with the Lord on March 28, 2019 at age 91. Mrs. Rogers, affectionately known as Delphine, 91, attended the local school of Sumter County. She accepted Christ at an early age at the Joshua Baptist Church where she served faithfully until recently when a brief illness prevented her from attending. On August 5, 1950, she was united in holy matrimony to the late James Rogers and to this union, five children were born. 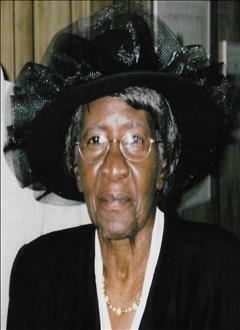 She was a faithful member of the Gospel Choir, Missionary Society, the Trustee Wives and the Sunday Church School for many years. Delphine was a homemaker most of her adult life. She would take on tasks such as; quilting, baking, sewing, gardening, canning, farming, and making the best biscuits. The most important task she engaged as a homemaker was teaching her children about the Christian values and how to respect their elders and peers. She is survived by her children, James Windham of Sumter, SC, Willie and Hazel M. Rogers of Bishopville, SC, Clarence and Carolyn Linton Rogers, William and Carrie Rogers Loney, Warren and Emma Rogers Gainey, all of Sumter, SC and Matthew and Teresa Smith Rogers of Hopkins, SC; one sister, James and Eva Windham Johnson; one brother, Charlie Windham, all of Sumter, SC; grandchildren, Towanda, Vicky, Willie Jr, Jacinta, Carin, Clarence Jr, Chanda, William Jr, Natia, Shakirah, Alicia, Warren Jr and Robert; great grandchildren, Chynah, Tristan, Khadijah, Tristan, Caidyn, Uriah, Drew, Mia, Phyllese, Jayla, Desmond II, Drearden, Danielle, Gavin, Karm'a, Jayden, Kingston and Kameron; two former loving, daughter-in-laws, Johnell Durant Rogers and Carol Simmons Windham; other relatives and friends. She was preceded in death by her parents, husband, parents-in-law, John and Emma Mickens Rogers; sisters, Inell Windham Stover and Corine Windham Johnson; Sister-in-law, Lillie Tucker Rogers; brothers-in-law, Tallie Rogers, Deacon Cornell Stover, Sr and Isaac Johnson. The family wishes to thank MSA Hospice of Sumter for their care of Delphine in her last days, Pastor Gene Dennis and Joshua Baptist Church for their spiritual care and concern, Carol Simmons Windham who kept a watchful eye on her from afar and Johnell Durant Rogers who made sure that she got to church school on time every Sunday that she attended.